Once the work is complete, you will be able to log in as normal but will notice a number of enhancements.This upgrade will provide an even more user friendly and modern experience for students and staff alike. Many existing features have been improved and some exciting new features added to make the user experience more efficient. *Some of these features are subject to change and agreement of social ‘cloud’ policy and testing. The new Global Navigation feature refers to the set of links that appears at the very top right of the Blackboard Learn frame. This set of links has been streamlined and becomes the entry point to My Blackboard and social learning tools. Access points to your courses and other information are organised in one place to provide a consistent, quick, and easy way to find information. 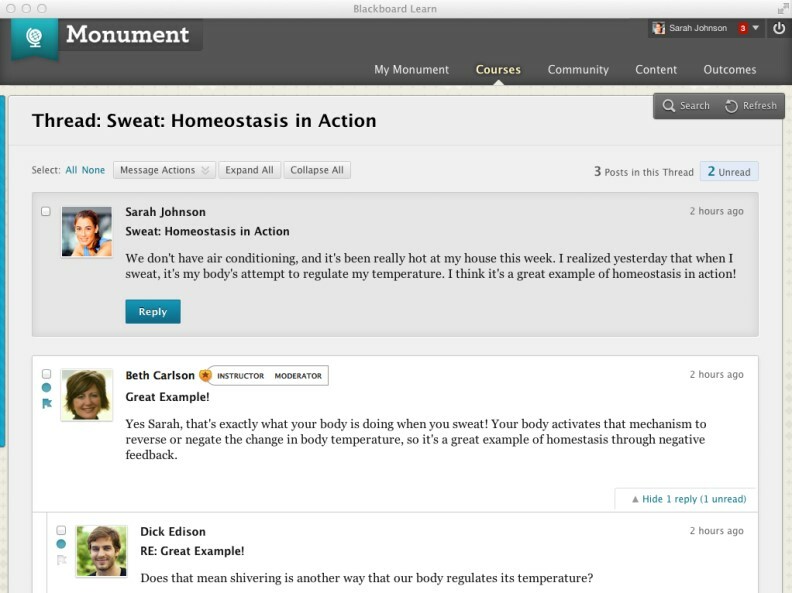 The new My Blackboard feature provides information from across Learning Edge for users. Users access My Blackboard via the new Global Navigation Menu at the top of the screen. My Blackboard has a navigation panel that quickly connects to the new My Blackboard tools – Profile, Updates, People, and Posts – as well as courses, organisations, and settings. With this enhancement, Blackboard have thoroughly revamped the look and feel of this tool. The first thing you’ll notice are the large avatars or profile pictures, so it’s a lot easier to identify tutors or fellow students. And now you can see all threads on one page, but if this gets overwhelming, you have the ability to collapse and expand them. All posts on one page: The entire discussion thread appears on a single page, thereby maintaining the context of posts and replies to one another. Avatars: The user profile avatars are more prominent in the new Discussions. Conditional highlighting of instructors’ posts: It is easier for students to find posts from instructors in a sea of other posts. Respond to posts inline: When clicking “Reply”, the content editor appears in the context of the discussion so as not to disrupt the flow of the user. The full content editor is available for the user to write a reply. When finished, submitting the post adds it directly into the page without losing context. Inline Assignment Grading is a revision to the workflow for grading submissions via the Assignment tool. Now instead of downloading the files that you need to view, edit and grade, you can view the Word, Excel, PPT docs or PDFs “inline” within Learning Edge. Instead of downloading student-submitted files to view or edit, you will now be able to view student-submitted files “inline,” i.e. in the web browser, without requiring any plugins, applets, or client-side applications. 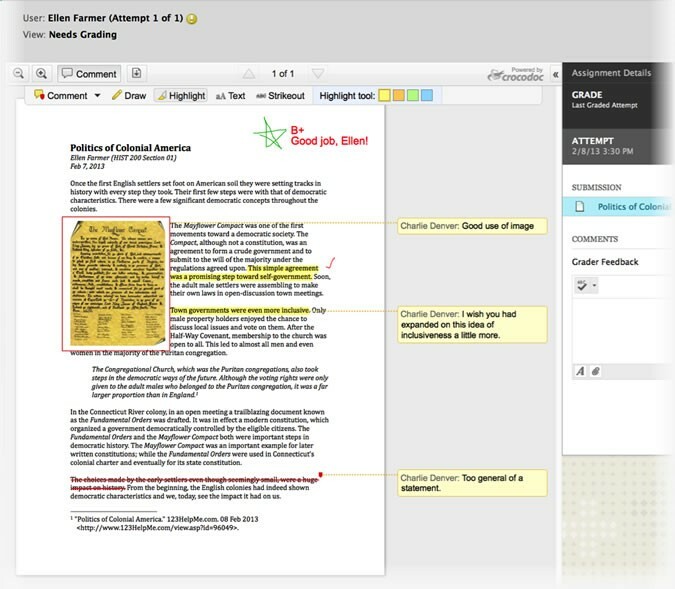 Additionally, annotation tools will be made available as part of the inline viewer, enabling tutors to provide feedback including comments, highlights, and even drawings/annotations directly on the inline view of the document. 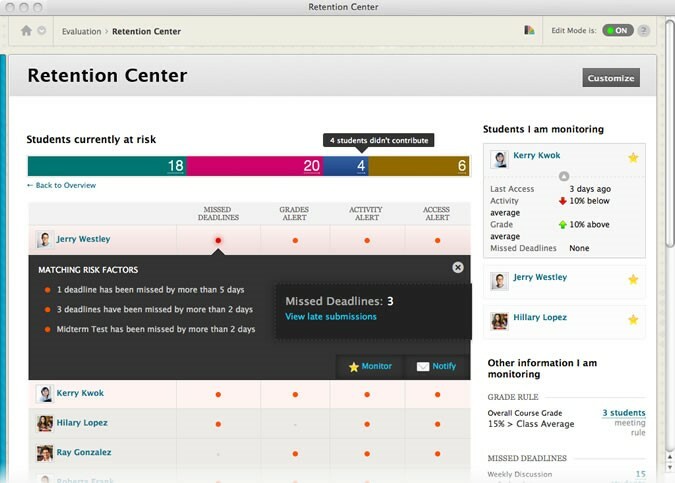 The brand new Retention Center provides tutors with an easy-to-use data visualisation and pre-configured rules for identifying at-risk students in a course. Because it requires no set up on the part of the tutor or administrator, it automatically calls out students who may need the tutor’s attention, making it easy for tutors to catch and respond to risk factors quickly, while there is time to help the at-risk students succeed in the course. With this new calendar, you can spend less time organising your calendar and more time doing what’s on it. Consolidate your course items into this easy-to-use calendar. Add events, drag and drop to change due dates, input course reminders. Students and tutors can view items that are past due, due today, or due this week by navigating to the overview capability in My Blackboard. From the image below you can see that it’s much more modern, in terms of both look and functionality. You can select views (month, week, and day) and color-code the events to differentiate courses and personal items. Items with due dates automatically appear on the new Learning Edge calendar. If you change a due date within a course area, the calendar gets updated for students as well. Calendar events may be viewed at once– or filtered to show only the desired mix of class and personal events. 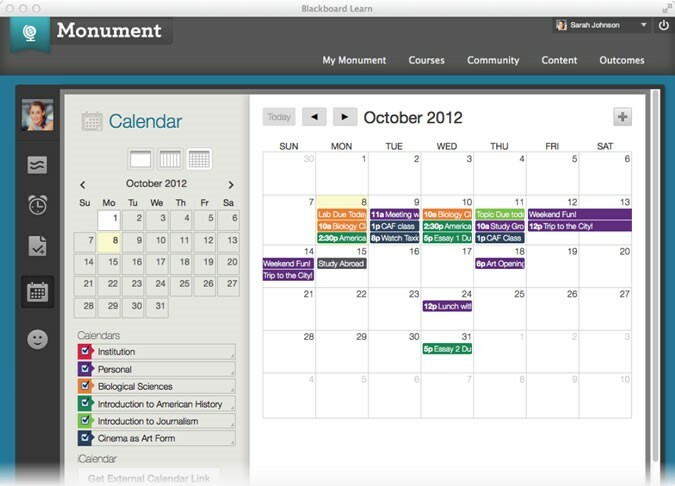 Users can select which calendars to view, ranging from personal to institution to individual course listings. These calendar items can also be exported via an iCal feed to Outlook, Google or other 3rd party calendars. The new Item Analysis provides statistics on overall test performance and on individual test questions. This data helps faculty recognise questions that might not adequately discriminate between students who understand the material and those who do not. Faculty can use this information to improve questions for future tests or to adjust marks on current attempts. Ineffective or misleading questions are identified easily, corrected in the Test Canvas, and are re-graded automatically. We hope you like the look of these new features and would be happy to hear your thoughts via the comments section below. This entry was posted in Learning Technologies, Software and tagged Learning Edge, Service Pack 12, SP12, upgrade by Mark Wilcock. Bookmark the permalink.